There are several reasons I really enjoy my day job: 1) I get to use my journalism skills without having to deal with the headaches and hassle of actually working for a newspaper; 2) fun co-workers and superiors who respect me and my abilities; and 3) the youthful energy and inquisitiveness of a university setting is intellectually stimulating. But the card that trumps them all is the fact that I regularly get to work on articles as nifty as this one. I mean, moonbows? What's not to love? 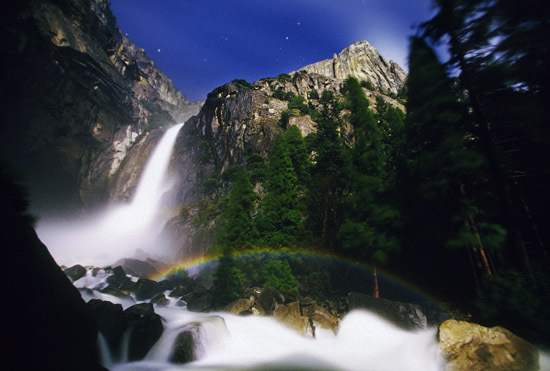 Famed naturalist John Muir once urged visitors to Yosemite National Park to seek the elusive, ethereal moonbow at night in Yosemite Valley. Now, a team of astronomers from Texas State University-San Marcos has applied their unique brand of forensic astronomy to the rainbow’s nocturnal cousin, unraveling when and where this little-know natural phenomenon can be viewed in the remote California wilderness. Texas State physics professors Donald Olson and Russell Doescher, along with Mitte Honors students Kellie Beicker, Ashley Ralph and Hui-Yiing Chang, publish their findings in the May 2007 edition of Sky & Telescope magazine, on newsstands now. Although people have been watching for moonbows for centuries, this is the first time anyone has calculated dates and precise times for appearances of this unusual event. Conditions must be ideal for moonbows to form--a bright moon and abundant water droplets suspended in clear air in opposite directions from the viewer--and because of this rarity, few people have ever seen one. Figures from Aristotle to Benjamin Franklin have written about the rare phenomenon throughout the ages, but as early as 1871 Muir wrote enthusiastically that moonbows could often be found forming in the fine spray coming off Yosemite Falls--no rain clouds required--and he described their beauty in his 1912 book, The Yosemite. The Texas State researchers, inspired by Muir’s accounts of the spectacle, developed a computer program which would allow the accurate prediction of dates and times favoring the appearance of moonbows at the Yosemite waterfalls. The research team quickly established six criteria necessary for Yosemite moonbows to form, which they modeled with their software: clear skies around the moon; abundant mist at the base of the falls; dark skies; bright moonlight; moonlight not blocked by mountains; and correct rainbow geometry. Determining the precise topography and geometry to satisfy the final two criteria in the program required on-site research, and in September of 2005 the Texas State group traveled to Yosemite. The resulting data gained from extensive surveying and on-site topographical research paid off immediately. Upon return to Texas, Olson and his team discovered why a moonbow anticipated by photographers on the evening of June 22, 2005 failed to appear despite apparently perfect conditions. Due to the unique geometry involved, Olson realized that the moonbow did in fact appear--but not until 12:45 a.m., long after the photographers had given up and gone home for the night, thus proving the value and usefulness of the Texas State researchers’ efforts. The team’s predictions have subsequently been tested by photographers traveling to the Yosemite Valley with spectacular results. The Texas State researchers have published their moonbow predictions for the remainder of 2007, along with additional information on the positions of the moon and factors involved in the formation of moonbows online at http://uweb.txstate.edu/~do01/. Be sure to check out the image gallery while you're at it. Since you have chosen to use my moonbow photograph in your blog I would appreciate receiving credit for it. You can view more of my work at www.grantjohnson.net. All images are © 2007 Grant Johnson.